The RoadLink from Wolf Tooth Components unlocks nearly limitless gearing options for road or gravel bikes. By offsetting the rear derailleurs position, it’s possible to run a wide-range mountain bike style cassette with a standard road drivetrain. Whether the ultimate goal is to move to a single-chainring drivetrain without losing any gear options, or just to open up new terrains and routes, the RoadLink is an ideal choice. Optimized for use with 10 or 11 speed cassettes 11-36t or 11-40t cassettes without compromising the shift quality of the smaller cogs. The RoadLink performs best when paired with the Shimano drivetrains it was designed for, however it works with SRAM and Campagnolo drivetrains as well. The RoadLink installs in just minutes and is simple enough to be done in your garage. 11-32: Not Required (GS medium cage rear derailleur works). 11-34: Single or Double Chainring. 11-36: Single or Double Chainring (front rings can be no more than 14 teeth different e.g. 48-34). 11-40: Single or Double Chainring (front rings can be no more than 10 teeth different e.g. 46-36). The wife and I wanted lower gears for touring. She has 105 and I have Ultegra. I was able to get a 40 tooth cogset on hers and 42 on mine. The RoadLink worked perfectly. I bought this to be able to put an 11-36 cassette on my SRAM Apex drivetrain that comes with an 11-32 cassette. The information online says everything will work just fine. There was just one issue. 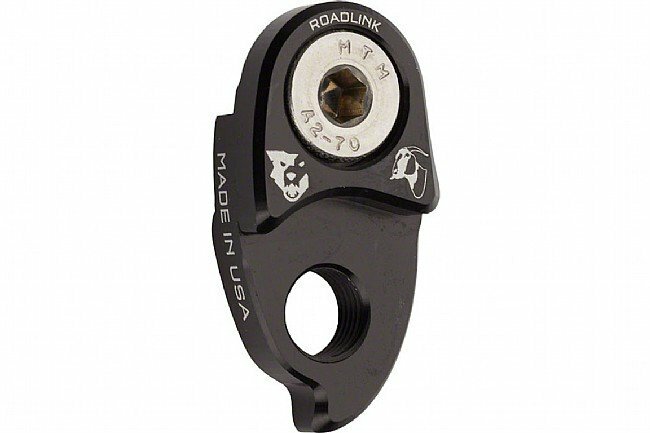 The roadlink part is supposed to be a perfect match for shimano derailleur hangers (which actually have a mechanical spec), but they don't fit the derailleur hangers used in SRAM systems. After a little googling I found that the roadlink support web page suggests filing down the derailleur hanger to make the roadlink fit. So that's what I did. It is a minor thing, but this should at the very minimum be included in the product information included on both the website and in the packaging. Once the hanger was filed down for the roadlink to fit, it has worked perfectly. The 11-36 cassette shifts smoothly and it got me up Mt Washington just fine. I am using this with a 46-30 crank and an 11-40 cassette and it works great. I have the FSA EVO Adventure Crank and a Shimano 11-40 XTR cassette, 11 speeds. The product specs suggest that the above 16 tooth differential for an 11 speed drive will not work, but mine works great. I initially used this with 46-36 shimano ultegra with an 11-40, adjusted that to a 46-34 shimano ultegra with the same 11-40 cassette. The 46-30 does create a bit of a large shifting gap when going from the big chainring down to the small, but I usually just move my cassette down a gear to keep the gap smooth. The really low gearing is for my gravel bike, that I often ride up steep dirt roadstrails and the low gear is a real life saver at times. Really glad for this product.